Koans are enigmatic spiritual formulas used for religious training in the Zen Buddhist tradition. 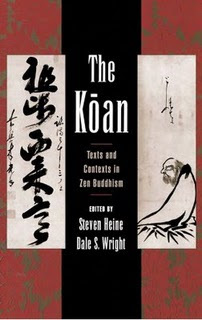 Arguing that our understanding of the koan tradition has been extremely limited, contributors to this collection examine previously unrecognized factors in the formation of this tradition, and highlight the rich complexity and diversity of koan practice and literature. Those with a serious interest in the history of Zen Buddhism will find the essays collected here an invaluable resource. The koan, often subject of unwarranted mystification, is examined in a series of eleven substantial essays by an international group of scholars. Disponible sur google livres pour ceux qui maîtrisent l'anglais. Notes de lecture en pdf téléchargeables sur the zen site .